This is a reminder that you should come out Thursday at 6pm at the Workforce Development Center for a community meeting to review and discuss the proposed General Plan. The plan does include the recommendations of the Wards Corner Comprehensive Plan and will provide a Vision for the Wards Corner Area for many years to come. The Workforce Development Center is located at 201 E. Little Creek Road, next to Kroger. Join us to discuss and critique the plan. Your comments and suggestions will be included in considerations for the final Plan. The draft chapters and the draft land use map can be found here. The flyer advertising the various plaNorfolk 2030 community meetings is here. Wards Corner should remain Suburban. Right now you can go to Wards Corner and shop at the Suburban Park Shopping Center. A few blocks away you can drive down Suburban Parkway and visit a neighbor in a stately house on a large lot in Suburban Acres. Looking at a zoning map, or simply driving around the neighborhoods surrounding Wards Corner, one can easily discern that this is suburbia. Living in suburban Norfolk is not a bad thing. I could talk for hours about the benefits – from commute time to proximity to amenities. But when it comes to the revitalization of Wards Corner we must be reminded that when this area was developed in the 40s and 50s it was the crossroads of the city and it was built around the automobile. The land use has not significantly changed since that time. The bulk of the neighborhoods from Hampton Blvd to Tidewater Drive and from the Granby Street bridge to Bayview Ave continue to be mostly low density and auto centric. Traffic counts are not only evidence of the auto-centric nature of the greater Wards Corner area but also proof that Wards Corner is a fantastic location for commercial development easily accessible by the automobile. The traffic count on Granby St near Wards Corner is 27,000 vehicles per day. Little Creek near Wards Corner is 26,000. I-64 at Wards Corner – a whopping 148,000 vehicles per day. Rebuilding Wards Corner as a commercial area in which the bulk of the customers arrive via automobile is best and most appropriate use of the land. A possible Harris Teeter is a good thing. Let’s set the record straight. As far as I know there is no deal with Harris Teeter; it’s a rumor. And the City has not offered tax dollars, or tax abatements, to the developer either. I have confirmed this with Councilmembers and staff. Nonetheless, a Harris Teeter at Wards Corner would be fantastic news and an immediate upgrade. Despite there being a number of other grocery stores in the Wards Corner area, a Harris Teeter would be a benefit as a high quality retailer that will attract other retailers of the same or similar quality. For years this is what the residents of Wards Corner have been demanding. The demographics support revitalization as well. Historically Wards Corner was the preferred shopping area for residents of Larchmont, Edgewater, Lochaven and east and north to Ocean View. Given the lack of a higher quality grocery store in those areas and the traffic to get to Harris Teeter’s Ghent location, it is foreseeable that those residents will return to a revitalized Wards Corner. The shopping centers currently in Wards Corner suffer from functional obsolescence. The narrow and deep layout of most of the units is undesirable in today’s retail market and the parking situation can only be improved upon. Don’t look at the prospect of a Harris Teeter as simply another grocery store. Look at it as the start of the revitalization of the entire Wards Corner commercial district which needs to remain suburban in character. A district which will hopefully include new shopping, eating, and office destinations and maybe even a hotel. That is what we have been working so hard to achieve. About the writer: Martin A. Thomas, Jr. is a lawyer at the Decker Law Firm, a member of the Planning Commission for the City of Norfolk, an editor for Wards Corner Now, and a Vice-President of the Wards Corner Civic League. 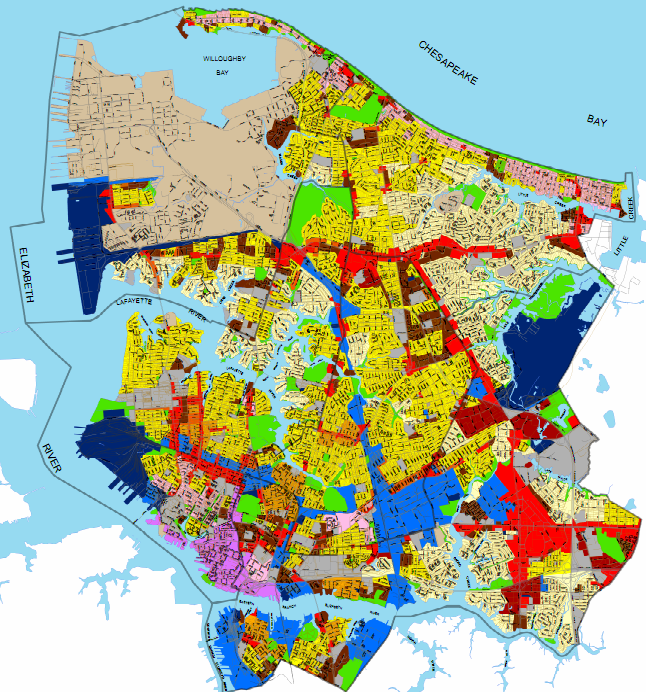 The Planning Commission, Planning Department Staff, and the City have been working for months on a draft copy of the new General Plan for the City of Norfolk. A community meeting will be held in the Wards Corner area on November 3, 2011 from 6-8pm at the Workforce Development Center, 201 E. Little Creek Road. Join us to discuss and critique the plan. You are currently browsing the Wards Corner Now - Wards Corner, Norfolk, Virginia blog archives for October, 2011.